Nishat Bagh is a terraced Mughal garden built on the eastern side of the Dal Lake, close to Srinagar in the state of Jammu and Kashmir, India. It is the second largest Mughal garden in the Kashmir Valley. 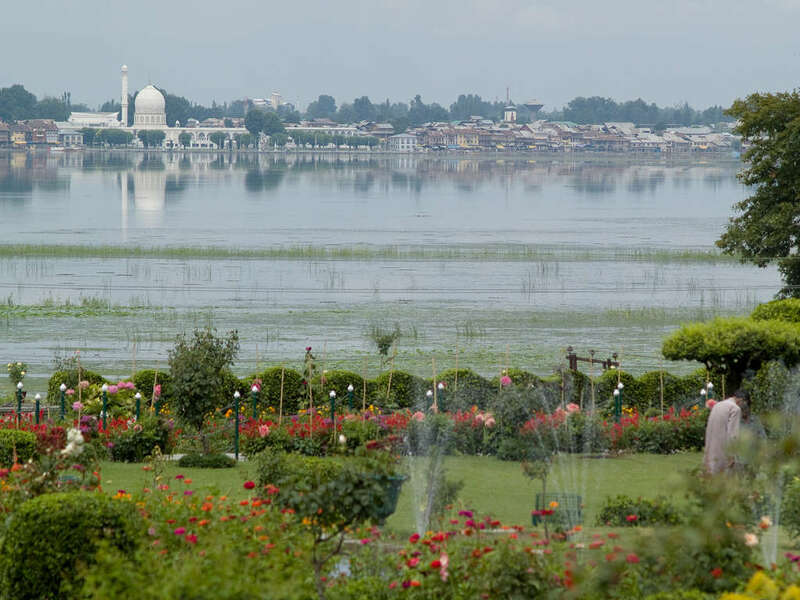 The largest in size is the Shalimar Bagh, which is also located on the bank of the Dal Lake. ‘Nishat Bagh’ is Urdu, which means "Garden of Joy," "Garden of Gladness" and "Garden of Delight. With the Zabarwan Mountains as its backdrop, Nishat Bagh is a garden of bliss that commands a magnificent view of the lake beneath the snow-capped Pir Panjal mountain range that stands far away to the west of the valley. The Bagh was designed and built in 1633 by Asif Khan, elder brother of Nur Jahan. Even though the layout of Nishat Bagh was based on the basic conceptual model of the Persian gardens, it had to be remodelled to fit the topographic and water source conditions at the site chosen in the Kashmir valley. The plan, instead of being central with four radiating arms in a square pattern as in the case of Chahar (suited for a flat country side), was changed to an axial stream flow design to fit the hill condition with water source originating at the top of the hill end. This resulted in planning a rectangular layout rather than a square layout. This helped in dispensing with the long side arms. Thus, a rectangular layout with east-west length of 548 metres (1,798 ft) and width of338 metres (1,109 ft) was adopted. Thus, Nishat Bagh as laid out now is a broad cascade of terraces lined with avenues of chinar and cypress trees, which starts from the lakeshore and reaches up to an artificial façade at the hill end. Rising from the edge of the Dal Lake, it has twelve 12 terraces representing twelve Zodiacal signs. However, it has only two sections, namely the public garden and the private garden for the Zanana or harem vis-à-vis the four sections of the Shalimar Bagh; this difference is attributed to the fact that the latter Bagh catered to the Mughal Emperor, while Nishat Bagh belonged to a man of his court, a noble. There are, however, some similarities with the Shalimar Bagh, such as the polished stone channel and terraces. The source of water supply to the two gardens is the same. Built in an east-west direction, the top terrace has the Zenana garden while the lowest terrace is connected to the Dal Lake. In recent years, the lowest terrace has merged with the approach road. A spring called the Gopi provides clear water supply to the gardens. There are a few old Mughal period buildings in the vicinity of the Bagh. The central canal, which runs through the garden from the top end, is 4 metres (13 ft) wide and has a water depth of 20 centimetres (7.9 in). Water flows down in a cascade from the top to the first terrace at the road level, which could be also approached from the Dal Lake through a shikara ride. The water flow from one terrace to the next is over stepped stone ramps that provide the sparkle to the flow. At all the terraces fountains with pools are provided, along the water channel. At channel crossings, benches are provided for people to sit and enjoy the beauty of the garden and the cascading flows and fountain jets.